Heat oven to 400°F. In large bowl, stir together apples, blueberries, 1 cup sugar, the cinnamon and tapioca; let stand 15 minutes. 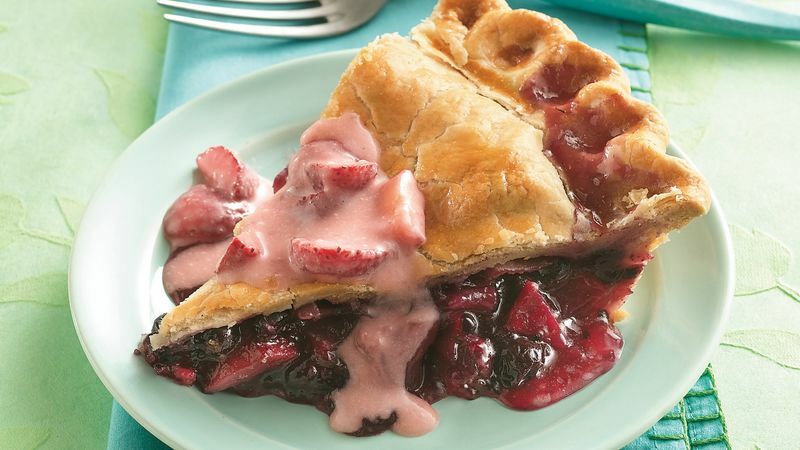 Make pie crusts as directed on box for Two-Crust Pie, using 9-inch glass pie plate. Spoon apple mixture into crust-lined pie plate. Dot with butter. Top with second crust; seal edge and flute. Cut slits in several places in top crust. Stir together egg and 1 teaspoon water; brush on top of crust. Bake 15 minutes. Cover edge of crust with strips of foil; reduce oven temperature to 350°F. Bake 40 to 45 minutes longer or until apples are tender. Cool on cooling rack at least 2 hours. Meanwhile, to make Strawberry Sauce, in 1-quart saucepan, crush enough strawberries to make 1/3 cup. Stir in 1/2 cup sugar and the wine. Heat to boiling over medium heat. Dissolve cornstarch in 2 tablespoons water; stir into strawberry mixture. Boil and stir 2 minutes. Remove from heat; cool to room temperature. Stir in whipping cream. Slice remaining strawberries; stir into sauce. Refrigerate until serving time. Top individual servings with sauce. Adjust the level of sugar according to how sweet your apples are. If using a very sweet variety of apple, decrease the sugar to 3/4 cup. Paula M. Reed, from Cantonsville, MD, won first place for this recipe at the 2004 Maryland State Fair. She went on to place in the national Pillsbury® Refrigerated Pie Crust Championship.